Capstone Financial Group, Inc. serves a range of client needs. The financial choices you make today will determine the lifestyle you can enjoy for many years to come. That’s why we offer a broad range of financial planning and investment management services designed to help you become retirement ready, stay secure throughout your retirement years and live like you want to live. Financial planning is at the very core of the services we provide to clients seeking to build, preserve and manage wealth over time. Retirement income planning, education planning, tax and estate planning and risk management services are components of a larger, more comprehensive financial plan designed to achieve multiple financial and lifestyle goals. Your plan also provides for your heirs and defines the legacy you choose to leave. Retirement readiness is the central objective of our clients and our practice. This means meeting your retirement income needs, maintaining your lifestyle choices and ensuring long term aspirations are funded for travel, healthcare, estate planning, educating children and grandchildren, charitable giving and other goals. We can help you develop a comprehensive plan to minimize taxes on income, retain ownership and control of your assets and evaluate variables in your retirement plan to ensure they are aligned with your overarching goals. If you are an independent professional or own a business, a qualified retirement plan can serve as a key element of your personal retirement planning. A well designed plan can minimize your overall costs while maximizing your own benefits from the plan. 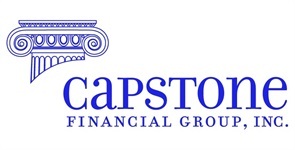 Capstone Financial Group, Inc. sponsors retirement plan documents approved by the IRS and U.S. Department of Labor that allow us to install customized plan 401(k) or defined benefit plan arrangements for our clients. Because we specialize in this area and have a long legacy of service to plans, we are able to provide sophisticated plan designs, keep costs to a minimum and maximize your own retirement readiness as well as that of your employees. The financial planning process is a key step in determining the proper asset allocation for your portfolio. This is because your feelings and attitudes about money, your current strategy, your objectives and risk tolerance all play important roles in determining how your assets should be invested. Our asset management strategy alleviates the need to focus on day-to-day market performance and concentrates instead on the performance of investment portfolios relative to your unique goals. We will monitor, update and apprise you of portfolio performance and new opportunities as they arise. Protecting yourself, your loved ones or your business against unexpected events is a fundamental aspect of financial planning. Closing the gap on potential risks can be tricky without a comprehensive plan and process that evaluates potential risk factors. That’s why risk analysis is an integral part of our ongoing process. We identify and analyze risk factors and make objective and unbiased recommendations to provide you with the peace of mind you seek. Whether you’re paying tuition costs now or saving for a future goal, it’s important to ensure your education strategy is compatible with achieving your retirement income and related financial objectives. Tax considerations and retirement income needs must be weighed and evaluated before choosing a specific strategy. We provide you with specific education needs projections for each child or grandchild based on specific schools that they might attend and assist you with deciding upon the correct methods of accumulating assets for your children and grandchildren. If health care costs continue their double-digit rise year-over-year, they will account for an inordinate percentage of retirement spending. When planning for long-term health care needs it is important to keep in mind that Medicare is not nursing home insurance and does not cover long-term care. Long-term care insurance can help manage health care costs and reduce the impact of inflation while ensuring your health care needs, and those of loved ones, are covered well into the future. There are also alternatives to insurance solutions. Adequate financial planning now can help prevent a lifetime of assets from falling short when you need them most. Preserving wealth from one generation to the next can be complex and time-consuming. Guidance from a competent and experienced advisor can go a long way toward ensuring your financial success is shared with your family, friends and the charitable organizations you designate, according to your wishes. We will help you to articulate your estate planning goals and we will work closely with your tax and legal advisors to ensure your financial plan reflects your estate planning needs. Or, if you prefer, we can provide you with a team of professional advisors adept at the intricacies of estate and tax planning. Whether you use a trust or another method for accomplishing your long-term estate planning goals, we can assist you in navigating today’s complicated tax and estate laws. Charitable giving can provide tax benefits for you and your heirs. A full assessment of the short- and long-term tax and estate planning implications is conducted to ensure your plan is aligned with your overall wealth management objectives.